I've hit a busy season with work! Through it all, my goal is to keep reading to my kids. I finally remembered to ask Erik to take our pics... 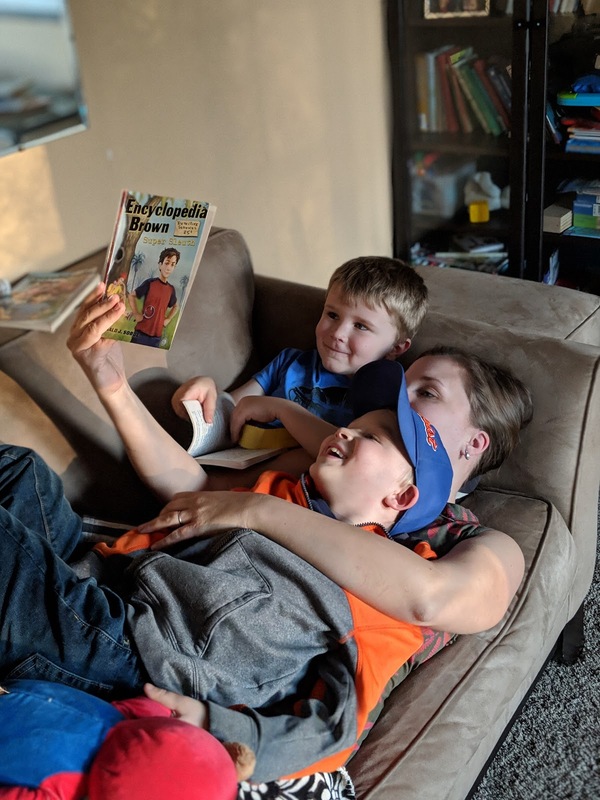 I've been reading with these kids on couches and next to beds for years, and the space we need as we read keeps expanding as they get bigger. Here's our latest pic and I love it. Keep reading to your kids... and grandkids! Which prompts an extra shout out to my mom, who reads to the kids via Facetime! YAY! don't despise the little things! We're hosting a baby shower at my house on Sunday, and so we are in full pick up the house and clean mode! Yesterday, my five-year-old was vacuuming the stairs and when he stopped he said, "Mom, mom! I figured out how the vacuum works!" He went on to explain how our hands hold the vacuum down and air comes out that pulls up the crumbs/dirt. It was a really fun moment, because a couple days ago, his older brother did something similar with a zipper. He had been zipping his coat and must have been contemplating how it actually worked, and then told me, very excitedly, how interesting it was and how he figured it out. It goes to show you that kids are always trying to figure out life! This is one reason I value homeschooling. I get to hear all those moments of discovery... and they happen all the time, even when they are helping with chores or putting on a coat. They don't need tons of extra stuff to learn. They just need a safe place to learn and someone who will guide them through it! I'm certainly not perfect, but I'm enjoying it! Wowza, it's amazing how quickly time goes by. Already April! I think it helps that we have more than enough to do as moms and wives and workers and such to fill each day and week. I remember realizing how a kid's calendar goes by so slow when they are waiting for a big event that is weeks out because all they have to do all day is play / school... the days are much longer then! Well, clearly I'm off my normal devo routine, and I'm rethinking what my blog will look like going forward. I may switch it up and mix in devos with 5 things I'm grateful for as well as homeschool stories. Yesterday was a fun homeschool day because we boiled down maple sap into syrup for the first time! It was something my hubs and I were interested in for a while, and it finally happened yesterday. The syrup was delicious! And it smelled so good as it boiled down. It was fun to realize how that experience was so good for the kiddos. They got to watch evaporation first hand as the sap changed to syrup. I think we are all excited that we get to do this all again each year! A lot of work, but it pays off. Oh and I ran to the gas station last night for vanilla ice cream to eat with our syrup! Delish treat after a long day of work (much of it my hubby's patience as it boiled!). We still have sap to gather. I think it might run for a few more days. We also have more sap to boil. Yay! more syrup. Anyway, I hope your week is going well! Thanks for reading about what is going in my world! 2. Pianos. They are beautiful. 3. Colored socks. So much more fun than regular, and yes, I wear them mismatched! It's easier than matching socks regularly. 4. Our old sofa. I'm sure I'll have to get a new one eventually, but this sofa has seen many times of bedrest and stories. 5. Tutus. I still am amazed to look at my little girl! What a blessing! I sometimes still pinch myself that it's real, for I fully remember when we just had the two boys and I was happy and loved it, but my husband and I would talk about a girl. SO much fun to have that become a reality... especially after my first baby was born prematurely! I remember the days when I didn't know if I could have a baby, and now I have three to hold. How about you? What five things are you thankful for? Loving spring! How about you? I love this verse. Trust in the Lord with all your heart. Everything. All of it. He will take care of you. Ahhh, I know, I know... I'm working on keeping my sugar cravings under control! It's a road map. Encouragement for each day! Today I got to go to a park and just sit and let all my kids play! So nice after years of following them around to keep an eye on them! My youngest (1.5 yrs) is adventurous and loved walking/climbing/going down slides on her own. It was fantastic! I know this is a two-edged sword, but today I am thankful for all the research that can be done in a few clicks! And yes, double check your clicks since you can't believe everything on the Internet! That's all for today... how about you? 1. Being outside and talking to people in not freezing weather! 2. Kids running around outside, getting fresh air and wearing themselves out before bed! 3. Fun adventures in trying international food! This week we tried chicken souvlaki and baklava from Greece! 4. The time after kids go to bed. It's wonderful and refreshing to take a moment to catch up on things and/or have a moment to just be me. Love it! 5. Erik - he does all these woodworking projects around the house and outside and lets the kids do it with him and learn. Great learning opportunity for them.